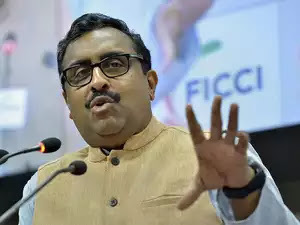 AIZAWL, Oct 3: Bharatiya Janata Party (BJP) would fight all the 40 Assembly seats in Mizoram alone, but the party might forge an alliance with like-minded parties in a postpoll scenario, party general secretary Ram Madhav said on Wednesday. Mizoram is the only State under Congress in North East at present. The saffron party has been making concerted efforts to win the State, after having formed governments on its own or joining hands with allies in all other Northeastern States. Addressing a press conference here, Madhav, who is in charge of North East, said BJP would field candidates in all the 40 Assembly seats in the State, where elections are due in December. In the 2013 Assembly poll, Congress had won 34 seats and made Lal Thanhawala the Chief Minister, while the BJP has no MLA at present. On the Opposition calling the Mizo National Front (MNF) “proxy” of BJP, the general secretary termed it “ridiculous”. The party would contest against MNF and National People’s Party in the polls, though they are constituents of North East Democratic Alliance (NEDA), Madhav said. NEDA is a political coalition formed in 2016 by BJP, along with North East regional parties like Naga People’s Front, Sikkim Democratic Front, People’s Party of Arunachal, Asom Gana Parishad and Bodoland People’s Front. Madhav asserted that BJP “respected” the food habits, distinct culture and customs of the Mizos and their religion. He accused the ruling Congress, headed by Chief Minister Lal Thanhawla – in power for 10 years – of being corrupt and inefficient.